Credit for this idea goes to my husband, who is always coming up with great ideas, but for things that are usually not knittable. 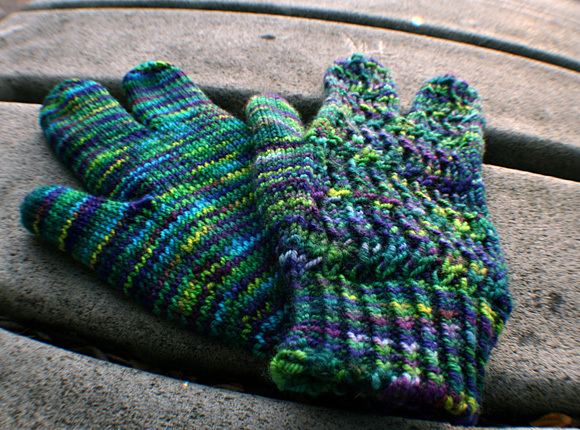 These started out destined to be just regular mittens (my first pair, even) with a cool stitch pattern on the back. 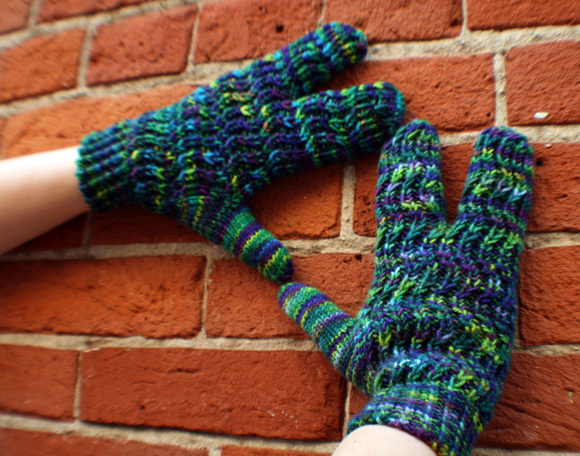 He suggested that instead of mittens I make them into “Lobster Claw” gloves like we’ve seen at sporting goods stores. The name, Tridactyl, means “three-toed” and seems fitting for the reptilian look that these gloves have. 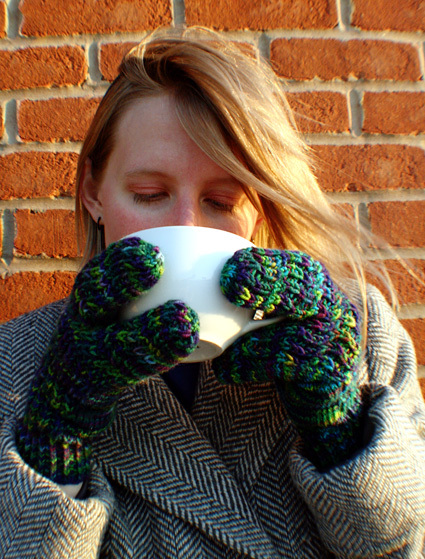 These odd looking creations provide the warmth of a mitten, with the dexterity of a glove. Thus, getting out your keys, turning radio dials, pulling the break lever on your bike, and even answering your cell phone are all possible while your fingers are kept warm! Amazing! The stitch pattern is perfect for showing off the multitudes of color in this yarn, but would also look striking in a solid yarn as well. You could play around with some color-work or cables and put some really interesting designs on the back, or leave it plain and use a self-striping yarn. My husband has already put in his request for a pair and I have a feeling I’ll be making several more for holiday gifts this year. Good thing they knit up fast! Note: Not all of each skein is used; if more length is needed, there should be sufficient yarn. Directions for both the Cable Cast On and the Alternate Cable Cast On (scroll to bottom of page) can be found here. This project is ideal for cabling without a cable needle. Directions can be found here. T2RP: Sl next st to cable needle and hold to back of work; k1 from left needle, p1 from cable needle. needle. T2LP: Sl next st to cable needle and hold to front of work; p1 from left needle, k1 from cable needle. Round 1: [P1, T2RP] to end. Round 2: P1, [k1, p2] to last 2 sts, k1, p1. Round 3: [T2RP, P1] to end. Rounds 4-6: [K1, p2] to end. Round 7: [T2LP, p1] to end. Round 8: Work as for Round 2. Round 9: [P1, T2LP] to end. Rounds 10-12: [P2, k1] to end. Repeat Rounds 1-12 for Wave Pattern. All Rounds: [K1 tbl, p1] to end. - Be sure the number of sts in the cuff is divisible by 4. 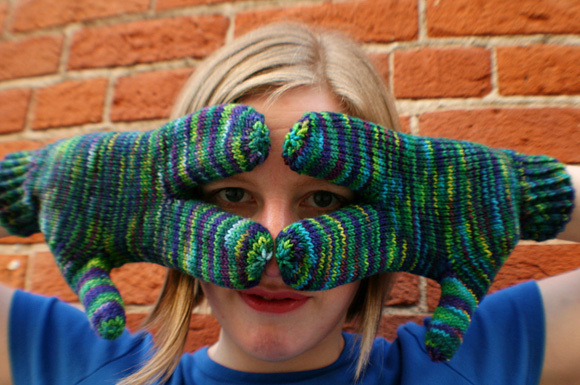 This will ensure that the total number of sts for the hand (before beginning the thumb gusset) is divisible by 6. - To resize the thumb, measure the circumference of the widest part of your thumb, then multiply by the stitch gauge per inch to determine the number of sts needed for the thumb. Round down to the nearest odd number. When increasing for thumb gusset, increase until there are 4 sts less between needles than desired number of thumb sts. Using alternate cable cast on method (see Pattern Notes), CO 36 sts. Divide sts between needles and join to work in the round, being careful not to twist. Work in Twisted 1x1 Rib until work measures 2 inches. Next Round: [K2, kfb] to end. 48 sts. Redistribute sts between needles, placing 12 sts on each needle. Round 1: K1, kfb, k to end of Needle 2; work Wave Pattern over sts on Needles 3 and 4. 49 sts. This round sets pattern for hand: sts on Needles 1 and 2 are worked in stockinette st, shaping as directed; sts on Needles 3 and 4 are worked in Wave Pattern. Rounds 2-3: Work in pattern as set. Round 4: K1, place marker, kfb, k1, kfb, place marker, work in pattern to end. 51 sts; 5 sts between markers. Rounds 5-6: Work in pattern as set. Round 7: K1, slip marker, kfb, k to last st before marker, kfb, slip marker, work in pattern to end. 53 sts; 7 sts between markers. Repeat Rounds 5-7 three times more. 59 sts; 13 sts between markers. Work 12 rounds in pattern, or until work reaches to point where thumb and hand meet. Next Round: K1, remove marker, place next 13 sts on hold on waste yarn, CO 4 sts using cable cast on method, join to continue working in the round; continue in pattern to end. 50 sts. Work 15 rounds in pattern, or until work reaches to division between middle finger and ring finger. Slip sts on Needles 2 and 3 to st holder or waste yarn. Divide sts on Needles 1 and 4 between four needles, placing 7 sts each on Needle 1 and 2, and 6 sts each on Needles 3 and 4. 26 sts. Round 1: K to end of Needle 2; using cable cast on, CO 2 sts onto Needle 2; work sts on Needles 3 and 4 in pattern as set. 28 sts. This round sets pattern for claw: sts on Needles 1 and 2 are worked in stockinette st, sts on Needles 3 and 4 are worked in Wave Pattern. Work 24 rounds in pattern, or until work reaches to just above tip of index finger. Round 1: K2tog, k to end of Needle 2; work in pattern to last 2 sts of Needle 4, k2tog. 26 sts. Round 2: Work all sts in pattern. Round 3: [K2tog] to end. 13 sts. Round 5: [K2tog] 6 times, k1. 7 sts. Place 24 held sts on needles, placing 6 sts on each needle. Set-up Round: Pick up and k 2 sts (1 st in each CO st) in CO edge at base of first claw; using same needle, k to end of Needle 1; k to end of Needle 2, work sts on Needles 3 and 4 in pattern. 26 sts. Work 20 rounds in pattern, or until work reaches to 0.5 inches below tip of ring finger. Round 1: K to last 2 sts on Needle 2, k2tog; work sts on Needles 3 and 4 in pattern. 25 sts. Round 3: K2tog, work in pattern to end. 24 sts. Round 4: K2tog, k to last 2 sts on Needle 2, k2tog; k2tog, work in pattern to last 2 sts of Needle 4, k2tog. 20 sts. Round 5: [K2tog] to end. 10 sts. Round 6: [K2tog] to end. 5 sts. 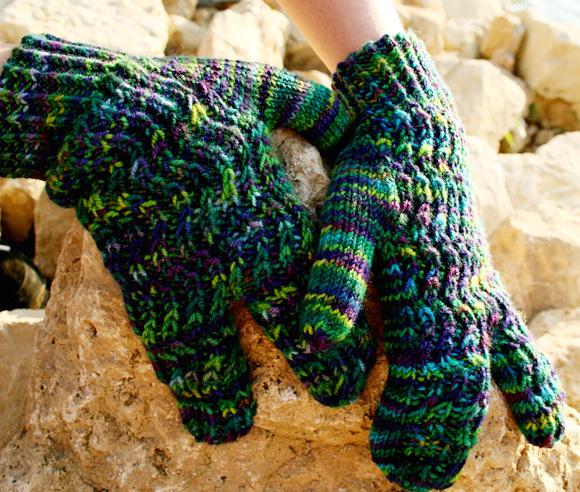 Pick up and k 4 sts (1 st in each CO st) in CO edge at point where thumb gusset joins hand. Place held sts of gusset on needle and k these sts, then k first 2 picked-up sts. This point (center of picked-up sts) will now be beginning of round; redistribute sts accordingly. 17 sts. K 22 rounds, or until work reaches tip of thumb. Next Round: [K2tog] to last st, k1. 9 sts. Repeat this round. 5 sts. Work as for right glove. Round 1: K to last 3 sts of Needle 2, kfb, k2; work Wave Pattern over sts on Needles 3 and 4. 49 sts. Round 4: K to last 4 sts on Needle 2, place marker, kfb, k1, kfb, place marker, work in pattern to end. 51 sts; 5 sts between markers. Round 7: K to first marker, sm, kfb, k to last st before marker, kfb, sm, work in pattern to end. 53 sts; 7 sts between markers. Work 12 rounds in pattern, or until work reaches to base of thumb (where thumbs and hand meet). Next Round: K to first marker, remove marker, place next 13 sts on hold on waste yarn, k1, CO 4 sts using cable cast on method, join to continue working in the round; continue in pattern to end. 50 sts. Slip sts on Needles 2 and 3 to st holder or waste yarn. Divide sts on Needles 1 and 4 between four needles, placing 6 sts on each needle. 24 sts. Round 1: K to end of Needle 2; using cable cast on, CO 2 sts onto Needle 2; work sts on Needles 3 and 4 in pattern as set. 26 sts. Round 1: K2tog, work in pattern to end. 25 sts. Round 3: K to last 2 sts of Needle 2, k2tog; work in pattern to end. 24 sts. Place 26 held sts on needles, placing 7 sts each on Needles 1 and 2, and 6 sts each on Needles 3 and 4. Set-up Round: Pick up and k 2 sts (1 st in each CO st) in CO edge at base of first claw; using same needle, k to end of Needle 1; k to end of Needle 2, work sts on Needles 3 and 4 in pattern. 28 sts. Round 1: K to last 2 sts of Needle 2, k2tog; k2tog, work in pattern to end. 26 sts. Weave in ends securely, sewing up any small holes between claws or at base of thumb. Tina spends her days working full-time and trying to convince her boss that he should be paying her to knit instead. This has been a fruitless effort. 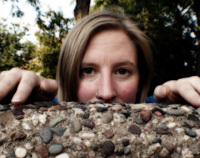 Her infrequent blog posts can be found here.